Weeds are a disappointing sight for anyone who takes pride in their yard, however, it is a fact that if we have a lawn and garden, we will most likely at one time or another have to deal with weeds. Eliminating these pests may not be as hard or time consuming as you may think. Most homeowners rush out to the purchase the latest professional weed killer pesticide to keep these unsightly plants at bay, however, there are several other methods to try to kill these stubborn weeds. Mulching your lawn is a perfect substitute for any weed kill pesticide product and is a much more healthier choice for the environment. Why does Mulch work so well at keeping these pesky weeds out of your lawn? Prior to laying your new turf or seeding your lawn, there were most likely weeds laying dormant beneath your soil. These seeds sit and wait for the right germination conditions for growth. Prior to laying your mulch its best not to disturb the lawn or soil for this reason. Mulch suppresses weed growth by stopping the sunlight from getting in, therefore preventing the germination conditions of the weeds. There are several types of Mulch that can be used on your lawn and very affordable to any home owner. As this is a do it yourself project there are no extra costs of requiring a professional. Store Bought Mulch: There are several types of store mulch available, most store bought mulch is screened and refined to ensure there are no weeds or contamination etc. A lot of these mulch also include nutrients and fertiliser which is great for your ground also. Grass Clippings: Lawn clippings are a great cost-effective way to use as mulch to help eliminate weeds in your lawn. Leave the catcher off next time you mow the lawn as clippings smother out weeds and fertilise your soil all at the same time. It’s completely natural and beneficial for the environment. Leaf Foliage: Mostly all leaf foliage can work also as a mulch, leaves and straw are also a great alternative. It is best to avoid hay and alike as it can contain weed seeds which will have the reverse effect. The idea of the mulch eliminating weeds is to crowd out the sunlight preventing the ideal conditions for growth. In your lawn, it is best to reseed any bare areas in your lawn as bare areas and sunlight are the perfect conditions for these pesky weeds to grow. Regular fertilisation and aeration of your lawn will also be beneficial. 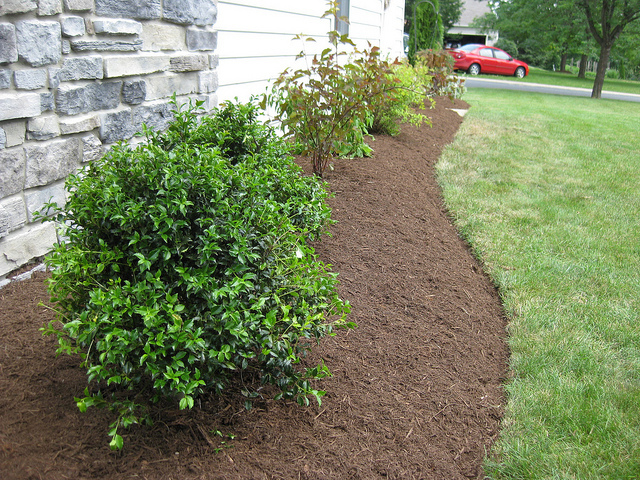 Once you have your mulch down, be sure to feed and water your lawn regularly to keep it nice and healthy. Over time, your lawn will thicken up and suffocate these weeds itself, using the same method mentioned above. In turn your lawn will basically deal with the weeds itself while you can just stand and enjoy your luscious thick, weed free lawn.